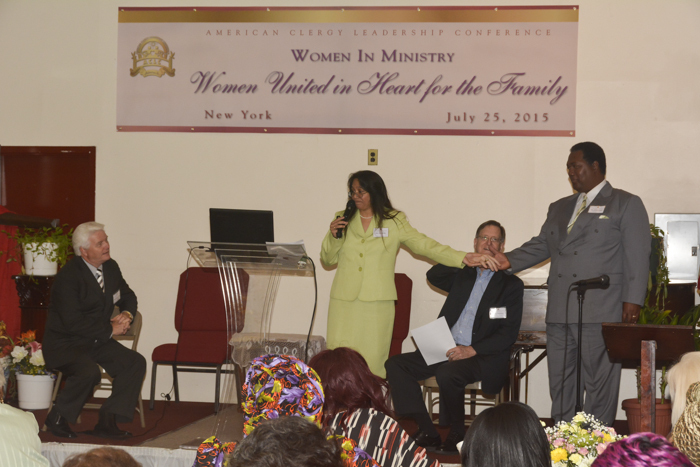 FFWPU USA: On July 25, 2015, a sunny Saturday, the American Clergy Leadership Conference (ACLC) Women In Ministry hosted a “Women United in Heart for the Family” conference at the Antioch Baptist Church in Brooklyn, New York. This event ran in conjunction with the Women In Ministry Four City Seminar Tour. Amidst the bright yellow decorations, ministers and guests arrived early to convene for a continental breakfast, spending time to catch up with one another. Over 100 participants arrived from the northeast, which included the New York, New Jersey, and Connecticut regions to regroup, share messages and inspire each other. As the event opened, the emcee, Bishop Sulanch Grand-Lewis, began the program with a performance of the song Amazing Grace, sung in a strong gospel voice. The fully packed six-hour conference continued with intervals of praise and worship, and proactive participation from the audience. The vocalist and pianist for the event, Tyetia Beckford, lifted the atmosphere of the church with her graceful music. Rev. Dr. Voni Johyn, the Co-chair of ACLC-NY, offered a moving opening prayer, after which all were introduced to their host, Dr. Robert Waterman. He spoke briefly, welcomed all the guests and showed enthusiasm to talk about family.